Passaros Suite Hotel kohteessa Puerto Iguazú, Argentiina: Varaa nyt! 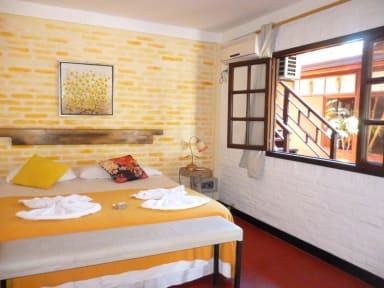 Passaros Suite Hotel is family business created with the purpose of providing a different service, making the customer feel relaxed, in a friendly environment and with personalised attention located in the land of the Iguazu falls, Misiones. Passaros Suite Hotel is distinguished by its warmth and harmony the combination of rustic, functional and tasteful details. We are located only 10 minutes from the terminal and 25 from the airport. Situated in Iguazu, this hotel is within a 15-minute walk of Hummingbird Garden and Punto Iguazu Shopping Mall. Iguazu Duty Free Shop and Aripuca are also within 2 mi (3 km). 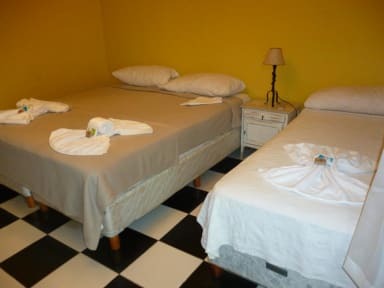 The private rooms are spacious comfortable and king-size beds. All rooms offer room service, flat-screen TVs with satellite channels, and hair dryers. Payment upon arrival by cash. This property may pre-authorise your card before arrival.